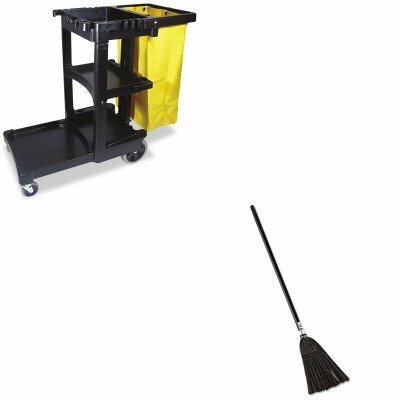 lt;stronggt;RCP2536lt;/stronggt;lt;BR/gt;Rubbermaid Lobby Pro Synthetic-Fill Broomlt;BR/gt;Specially designed broom is balanced for one-handed use, making it ideal for mall, restaurant and lobby use. Stiff stain- and odor-resistant synthetic bristles effectively move dust and debris. Heavy-duty, thickly lacquered wood handle minimizes the potential for cracking and splintering. Application: Bare Floors Indoor Bristle Material: Synthetic Bristle Length: 12amp;quot;.lt;BR/gt;lt;BR/gt;lt;stronggt;RCP617388BKlt;/stronggt;lt;BR/gt;Rubbermaid Lobby Pro Synthetic-Fill Broomlt;BR/gt;25-gallon vinyl bag attaches to handle. Three shelves for supplies hooks for mops and brooms. Platform holds standard size bucket supplies not incl.. Color: Black Caster/Glide/Wheel: Four Casters.